In Busy Nativity, children can push, pull and turn the tabs to join Mary and Joseph on their long journey to Bethlehem, marvel as a host of angels appear and see beautiful baby Jesus in his crib. Children will love playing with this bright and colourful Christmas board book with gentle rhyming text which introduces young children to the wonderful story of the First Christmas. Children will love playing with the easy-to-handle mechanisms in this bright and colourful board book with magical illustrations by Emily Bolam, which is part of the hugely successful Busy Book series from Campbell Books. 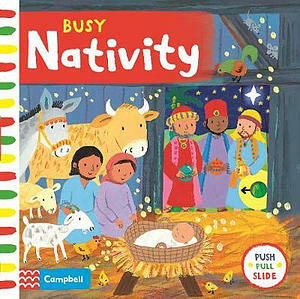 Busy Nativity by Emily Bolam was published by Pan Macmillan in September 2017 and is our 16573rd best seller. The ISBN for Busy Nativity is 9781509828951. Be the first to review Busy Nativity! Got a question? No problem! Just click here to ask us about Busy Nativity.